How plans change. Tonight I meant to start at Bardog for happy hour, then do a venue change to Ferraro’s about 7:30 for their first weekly trivia night. However, radar indicated that Ferraro’s, 10 blocks away in the rain and lightning, was not in the plans. So I settled in for Pint Night, where all draft beers were $3. “I’ll have the good stuff,” I told bartender Amanda Panda, “the PBR.” About 9 I had told people I was about to leave, then announced to the night shift who had just come on, “Well, you know… I think I’m going to have ONE MORE.” Hope no one was waiting on me to leave. I also ordered food. I asked how much a bowl of their award-winning chili was, and I think they said $6.29. I ordered that and the “daily dog,” which today was an Italian hot dog with onions, peppers, hash and mustard. Obviously I was thinking dipping with the chili. The amount of food I got was astonishing. They brought me two to-go bowls – not cups, bowls – of their chili, along with the dog pictured above. Either would have been a complete meal by itself. The math teacher in me is discovering that there’s a direct correlation between how many PBRs you have and how much food ends up on the floor. 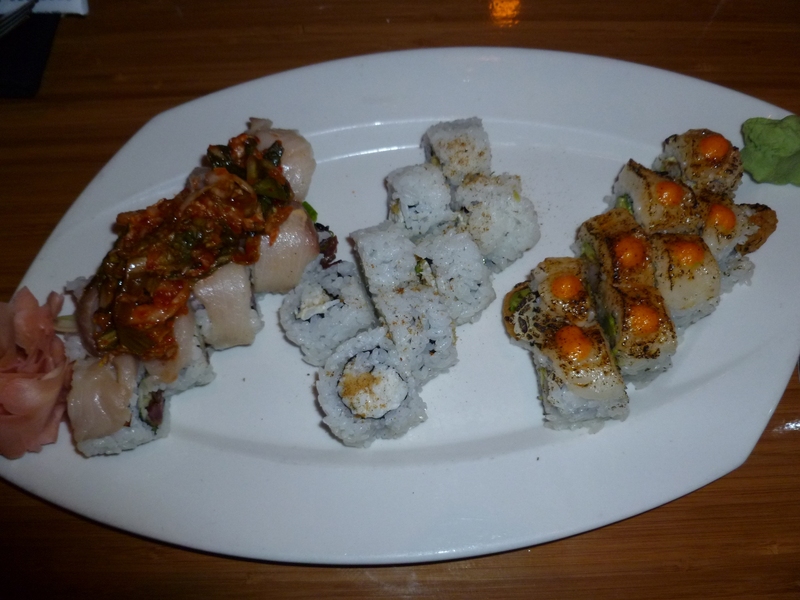 Last night I finally got to investigate the lead I’d been given on a great happy hour – the sushi happy hour at Blue Fin. I joined my friends at the new, expanded bar whose entrance is to the right of the Blue Fin patio. I told the bartender I was there for happy hour, and he had a server bring out the tray to show me my options. The clear plates up top were $3. The white plates were $5, and the dark plates were $7. 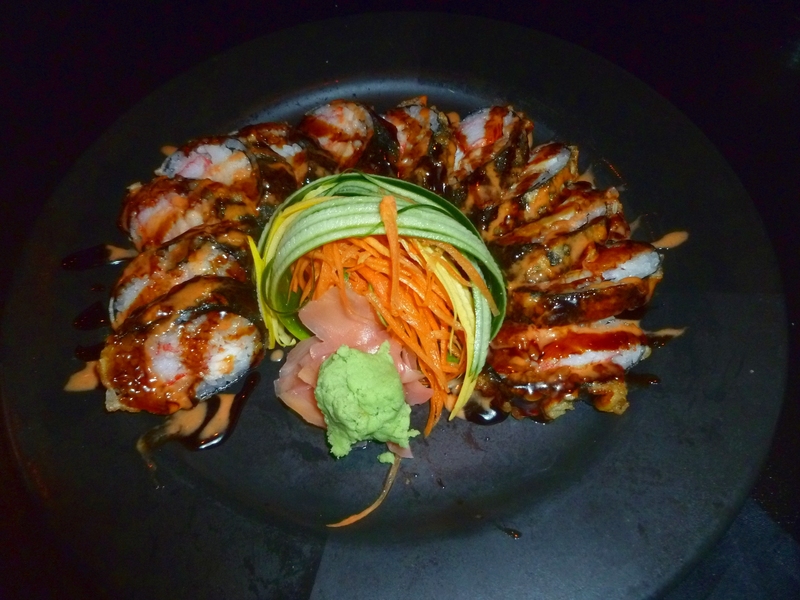 The $7 happy hour rolls were whole rolls and are on the regular menu for $10-11. 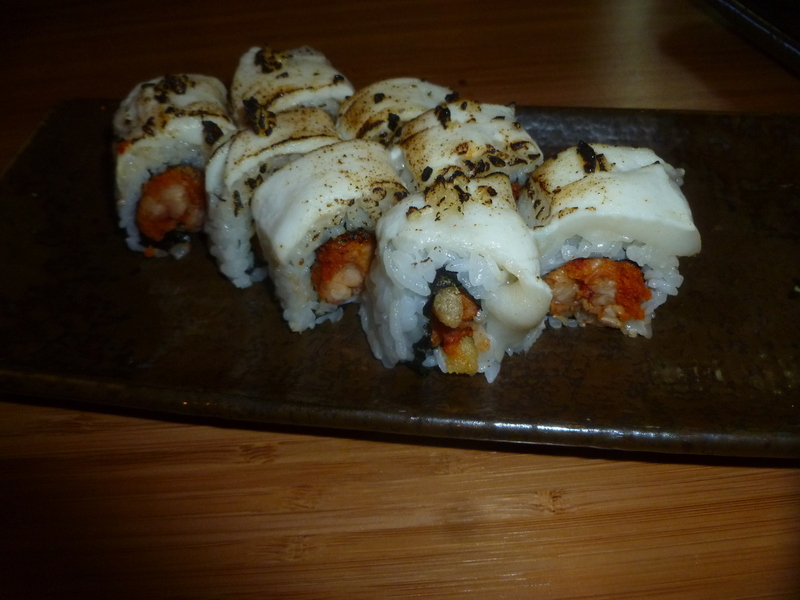 Above: My first selection, the Jacksonville Roll. Crunchy spicy crawfish and cilantro topped with seared walli. $7 during happy hour. My second selection, called “And the Oscar goes to…”. 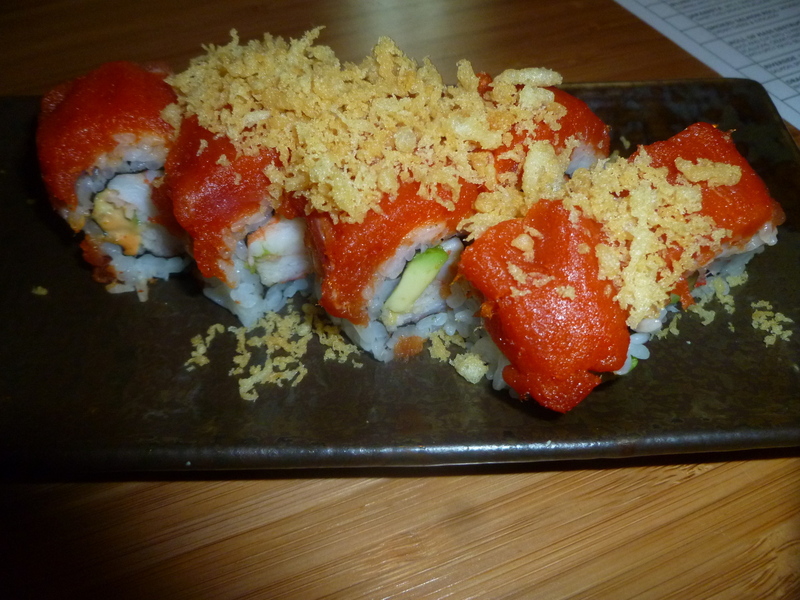 Spicy mayo, crab, avocado and shrimp topped with spicy crunchy tuna. Also $7. Sake was buy one, get one free. This was just an INCREDIBLE value. And the bar is unfortunately empty during happy hour, because people haven’t discovered it yet. I have a feeling that will change soon. Most undiscovered hidden gem of Downtown at the moment, and I almost considered not blogging it and keeping it to myself. That wouldn’t be fair though. 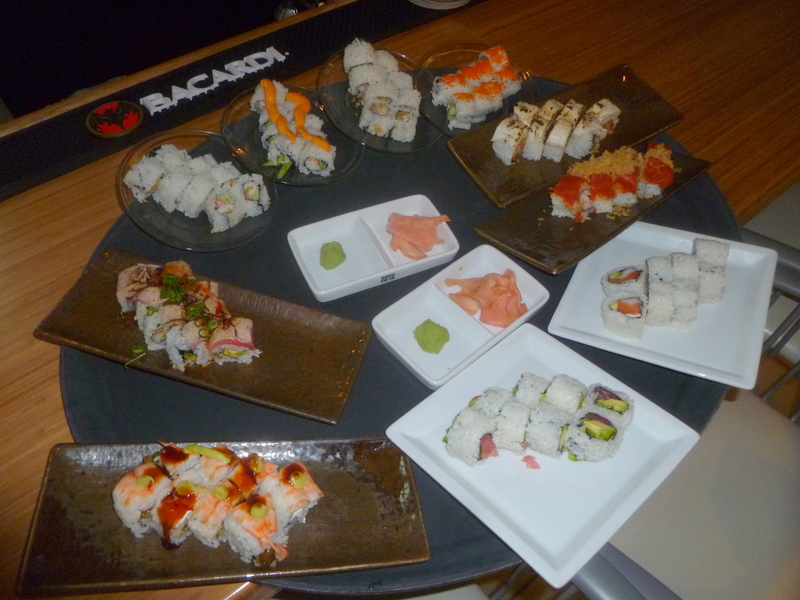 If you like sushi, you need to give Blue Fin’s happy hour a try. So I did. 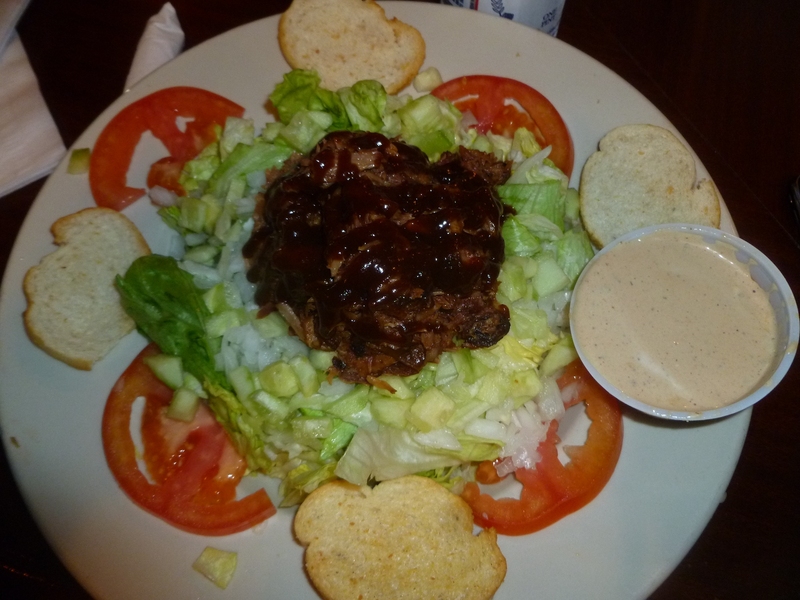 He was right – for $2.95 more than the price of a regular salad, they top it off with a generous helping of rib meat. You get your choice of the usual salad dressings, although I can’t imagine going with anything other than the house dressing, a BBQ ranch. It was pretty good. I probably won’t get it as often as I get the ribs, but for value it’s hard to beat. Bartender was friendly and remembered me, even though it’s been a good 6-8 months since I’ve been in. 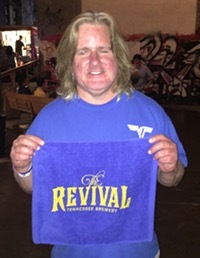 I was pleased to see 16 oz. PBR cans, a new addition, in the refrigerator case. Unless your name is the Flying Saucer you pretty much have to ride the PBR train if you operate a bar Downtown. While there, I was reminded that it’s been way too long since I had another of my Blues City favorites – hand rolled tamales with a cup of chili, also a really good value at $5.75. I’ll have to go back for a repeat visit soon. View their menu here. Saturday afternoon I was walking home from the Saucer to put on some warmer clothes. Bangkok Alley was on the way and I decided to stop in for a snack. I wanted sushi but didn’t have anything in particular in mind, so I asked the bartender what his favorite flash-fried roll was. I took his recommendation – the lobster roll. Lobster, shrimp, crab meat, and Tobiko, flash-fried. Topped with chef’s chili sauce. Before you ask, no I don’t have any idea what Tobiko is. It was good though.